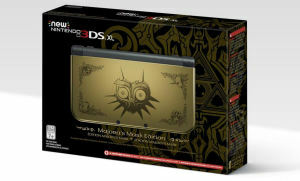 Excited about the New Nintendo 3DS, well over at GameStop you can now pre-order your console. However, according to our friends over at Gamnesia, the new handheld WILL NOT come with a digital copy of the game. You’ll have to purchase that separately, which if you already have the Limited Edition pre-order secured, that allows you to get almost all the goodies without getting duplicate copies of the game. Still, it seems un-Nintendo like to include a special edition version of the New Nintendo 3DS, without an actual copy of the game.